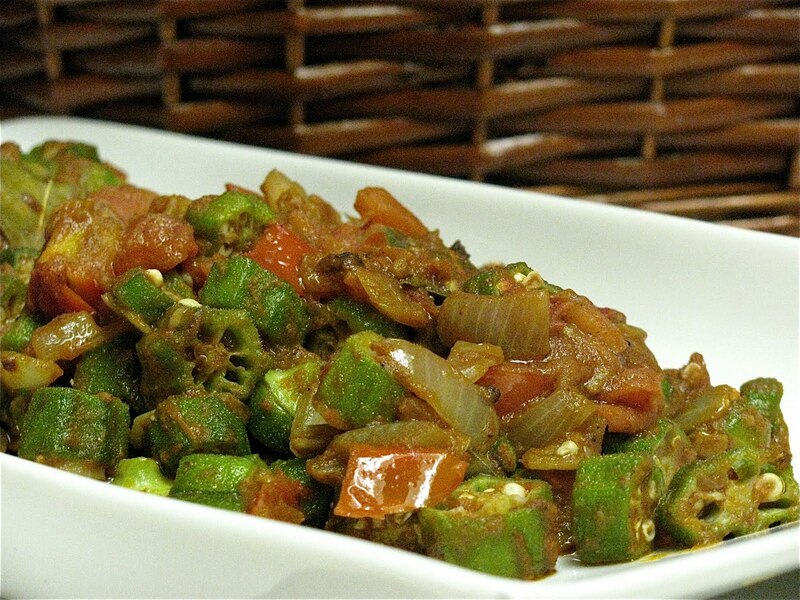 I've been craving for some okra since I started seeing the abundance of harvest at the Farmer's market and also at some local produce market. I finally bought some and the first dish I had in mine to prepare them was Indian style dish. This recipe was forwarded to me by a colleague and she said I should try it myself. I made a few substitution but still turned out quite tasty. 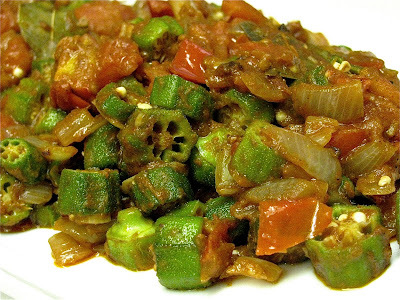 Slice the okra in small rounds as shown. Dice the onion and the tomatoes. Minced the garlic. Heat a large frying pan and add 4 tablespoon of oil. Add the okra and fried for about 5 minutes. Take out of the pan and set aside. Add the remaining 4 tablespoon of oil and add the bay leaves and cloves and cook for 2 minutes. Then add the onion and the garlic and cook until brown. Add the Garam masala, coriander, chile powder and ginger and cook for 2 minutes. Add the tomatoes and stir with the cooked spice, cover and cooked for about 3 minutes or until the tomatoes are soft but not mushy. Add the okra and stir slowly and cook for another 2 minutes then its done! Remove from pan and serve hot with rice or naan. I'm not a professional Chef, I just love to cook! I cook for fun and to entertain. I became passionate about cooking at the early age of 10. I used to watch my grandmother cook several types of dishes in the morning to sell at her small hot deli store. I often visited one restaurant on the same street block serving nicer entrees and I would sit in the kitchen mesmerized by how fast they will cut the ingredients and cook the delicious food. Those joyful moments gave me the feeling of being passionate about food - the way it was made, presented and of course, the taste of it. It was pure joy! My first hands on was stir frying garlic and onions to be added to previously simmered chicken adobo dish. The moment I started stirring the garlic, an old lady passed by the kitchen and said "the way that garlic smell, I can tell that you will be a great cook"! I can honestly say that the old woman's words did not just inspired me but made me realize I have a gift! I have used this gift to entertain family and friends. This passion I have for cooking made me appreciate anything that is edible - even insects! Joy is what God gives – He gave me this gift to share with you!